It takes a lot to design a utopia. Wonder Woman production designer Aline Bonetto recently revealed to Entertainment Weekly how she went around creating the film's signature locations, including Diana's homeland of Themyscira and the dark laboratories of World War I. 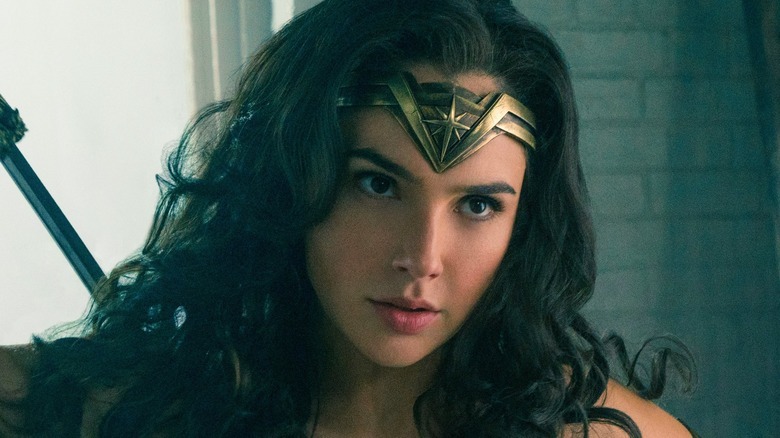 In dreaming up Diana's homeland, Bonetto said that she and director Patty Jenkins were inspired by the way in which Wonder Woman creator William Moulton Marston described Themyscira: Paradise Island. "We decided to make a mix of landscapes to build, in a way, our paradise island," Bonetto said, adding that they combined pieces of Greek islands with Chinese landscapes, along with a whole lot of waterfalls, to design the gorgeous land. Much of Themyscira's design was inspired by thinking about femininity, including the throne room. Bonetto said she designed the room by thinking about how women would have built things if they lived alone in a place. This resulted in an open, wall-less room, built in a cave to show harmony with nature. This harmony was also reflected in the spiral throne, inspired by the shape commonly found in nature; golden designs on the stairs, meanwhile, showed the society's connection to art. As shown in the trailers, Themyscira will not remain in peaceful tranquility for the whole movie, as invaders arrive on the island's beach in a sequence Bonetto describes as "gun against arrow." Bonetto said they searched the world for the right beach, looking for a large location with a big rock in the background. However, when rocks show up in nature, it usually means tides taking up the beach for half of the day, so they ended up settling for a location in southern Italy, with the rocks added in postproduction with special effects. "When I arrived [on the beach], the weather was so bad, quite cold and gray," Bonetto described. "And when we shot the scene, the sky was so blue and beautiful, and the sea was calm. I think God loves movies!" The film's visuals greatly change once Diana leaves Themyscira, with the hero plopped down right in the middle of the "fog, the really grey sky, [and] the rain" of World War I-era London. Bonetto said she designed those scenes to be a "big contrast" from the natural landscapes where she grew up. "Everything is a big shock," Bonetto described. Diana arrives on the docks, but soon goes to a pub, where she meets some of the film's other protagonists, including Sameer (Said Taghmaoui), Chief (Eugene Brave Rock), and Charlie (Ewen Bremner). "Suddenly Diana is discovering another kind of world, with another palette of color," Bonetto describes, adding that she made that scene warmer because of Diana's growing comfort level as she meets her allies. Bonetto said that the tavern scene, as well as many of the film's battle scenes, were inspired by impressionist painters of the era, including John Sloan and John Singer Sargent. At some point in the film, Diana's journey to bring peace to Europe lands her in a village in Belgium, which has been badly affected by the war. However, despite the violence, the village is also the scene of "a magical moment, a really magical point in a really terrible period." To capture both feelings, Bonetto combined images of Belgium during the war with inspiration from the 2004 Oscar-nominated French movie A Very Long Engagement. Diana faces off against a number of villains in the movie, including Ares, the God of War, and Elena Anaya's Doctor Poison. While both villains have been shrouded in secrecy, Bonetto gave some clues while describing Doctor Poison's laboratory, which she designed with a dark, monochromatic color scheme. This was contrasted by having Poison stand out in a green costume. "It was important she would be the strongest point of color in this set," Bonetto said. "She's working day and night, trying to find a terrible thing. You have to give the feeling that every tool, every bottle, is something on the way to create something more dangerous." Diana will also have to deal with the increasing brutality of human weapons, including the use of toxic gas. Bonetto wanted the laboratory where the gas was designed to be both historically accurate and terrifying, so she took inspiration from a real-life photo from World War I and added in women wearing gas masks as they work. "There is something a little bit surrealist," she said. "The smoke is a little bit orange. Seeing all these gas masks, you understand how terrible it is for the people working there." Wonder Woman's gorgeous visuals will be on full display when the film is released on June 2. As we wait for the movie to be released, prep by looking at some of the Easter eggs you may have missed in the trailer.